The Global Volcanism Program has no activity reports for Herbert. The Global Volcanism Program has no Weekly Reports available for Herbert. The Global Volcanism Program has no Bulletin Reports available for Herbert. The Global Volcanism Program has no synonyms or subfeatures listed for Herbert. The 10-km-wide Herbert Island, the SW-most of the Islands of the Four Mountains group, lies across a strait SW of Mount Cleveland. Herbert is a classic, symmetrical stratovolcano whose summit is broadly truncated by a 2-km-wide caldera that is breached to NW. No historical eruptions have been recorded from 1280-m-high Herbert volcano, which, like many other Aleutian volcanoes, has not been studied geologically. The Global Volcanism Program is not aware of any Holocene eruptions from Herbert. If this volcano has had large eruptions (VEI >= 4) prior to 10,000 years ago, information might be found on the Herbert page in the LaMEVE (Large Magnitude Explosive Volcanic Eruptions) database, a part of the Volcano Global Risk Identification and Analysis Project (VOGRIPA). There is no Deformation History data available for Herbert. There is no Emissions History data available for Herbert. Herbert Island, capped by the snow-covered peak in the right foreground, is a classic, symmetrical stratovolcano with a 2-km-wide summit caldera that is breached to NW. 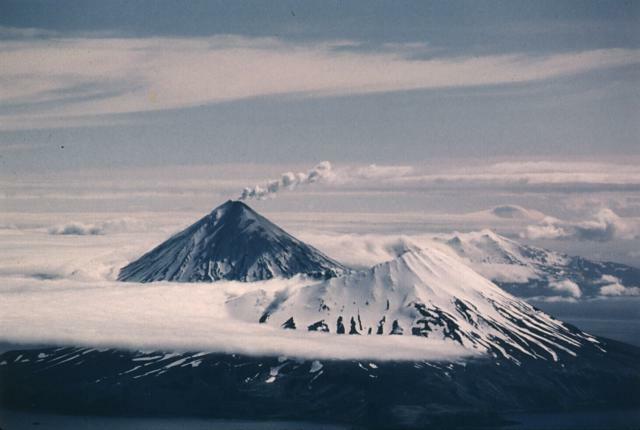 No historical eruptions have been recorded from 1280-m-high Herbert volcano, which, like many other Aleutian volcanoes, has not been studied geologically. This June 23, 1987, view from the WSW shows a steam plume originating from conical Cleveland volcano in background, whose slopes are darkened by ashfall from an eruption that began on June 19. There are no samples for Herbert in the Smithsonian's NMNH Department of Mineral Sciences Rock and Ore collection. Large Eruptions of Herbert Information about large Quaternary eruptions (VEI >= 4) is cataloged in the Large Magnitude Explosive Volcanic Eruptions (LaMEVE) database of the Volcano Global Risk Identification and Analysis Project (VOGRIPA).